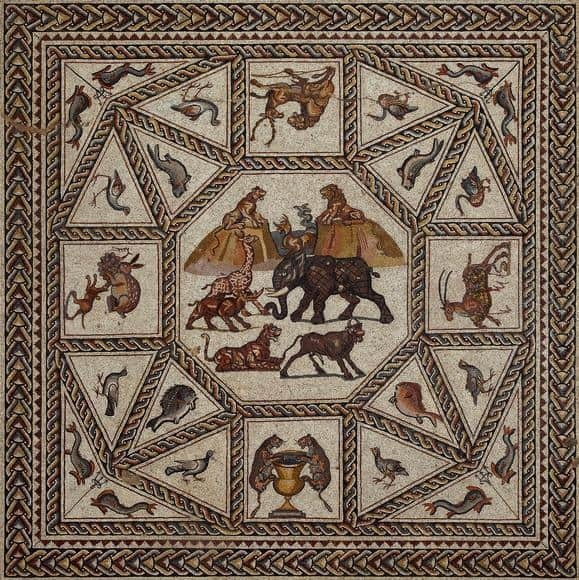 One of the best preserved of the more larger Roman mosaic floors was discovered in 1996 during the construction of a highway on the outskirts of Lod, just south east of Tel Aviv. Not only is this mosaic floor in excellent condition, it is beautifully crafted and detailed. And, the subject matter makes it all the more remarkable; for example, giraffe and rhinoceros were rarely depicted. The photograph above is just one portion of this extraordinary mosaic pavement, and measures about 13 square feet in size – the entire pavement measures 50 feet by 27 feet. The present day town of Lod was Lydda in ancient times. During the Jewish War Lydda was destroyed by the Romans, but it was refounded by Hadrian as Diopolis, and later in 200 AD given the status of Roman colony. Excavations have not revealed thus far what the building was. The lack of inscriptions indicate that it was probably a private villa as opposed to a public building. Coins and pottery found during excavations date to the third and fourth centuries AD, and suggest that the mosaic was created around 300 AD. The Israel Antiquities Authority and the Shelby White and Leon Levy Lod Mosaic Center have produced an exemplary website that details the discovery, excavation, preservation and conservation, as well as the lifting of the mosaic floors. Various pages on the website have a good collection of photographs and video clips; so if you have ever wanted to see how these mosaic floors are lifted, you can see it being done on the website. … The Lod Mosaic Website. Where is the Lod Mosaic? After being lifted in 2009, the Lod Mosaic toured various museums in the United States of America until 2013 when it went to the Louvre in Paris. Since then it has travelled to other centres in Europe. For the first half of 2016 the Lod Mosaic is back in the USA. more specifically at the Patricia and Phillip Frost Museum of Art in Miami (10 February to 15 May 2016) before returning to Israel, where it will go on permanent display in the Shelby White and Leon Levy Lod Mosaic Center in Lod, 15 km south east of Tel Aviv. Read my review of the exhibition when I saw the Lod Mosaic at Waddesdon Manor in England. I saw this mosaic at the Legion of Honor Museum in San Francisco. An absolutely wonderful exhibition – if you can get to Penn Museum to see this – do. Don’t miss it. I would like to recommend to your readers a video of the amazing research done on the Lod mosaic by Lillian Sizemore. Sizemore not only explains how the mosaic was constructed, but decodes the imagery and geometry that makes this work so spectacular. Watch the flat pavement become a 3-dimensional sphere … link to the video. Sincerely, Nancie Mills Pipgras, Editor Mosaic Art NOW. Nancie, thank you for adding the link to Lillian Sizemore’s video – greatly enjoyed it!